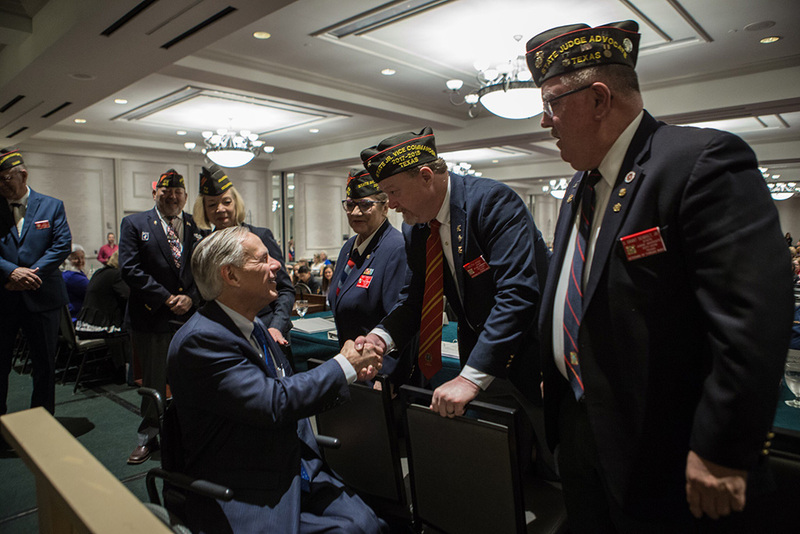 Governor Greg Abbott today attended the Department of Texas Veterans of Foreign Wars (VFW) Mid-Winter Conference in Austin, Texas. With more than 74,000 members, the Texas VFW serves as a legislative advocacy organization for Texas veterans, in addition to providing valuable community services and financial aid to military members and their families. Governor Abbott spoke at the convention’s opening session, offering gratitude for their service at home and abroad, in addition to reaffirming his commitment to give Texas veterans greater access to healthcare, education, and employment opportunities across the state. "We’ve made great strides to better serve our veterans in Texas," said Governor Abbott. But there is still more we must do to make sure every veteran returning home receives the support they need to re-enter civilian life and enjoy the freedoms they have fought so hard to secure. Our veterans deserve much more than our gratitude, and as Governor, I am committed to ensuring that Texas veterans receive our respect and opportunities to succeed. Texas is home to more than two million veteran active and reserve-duty military members. Governor Abbott spoke in detail about policies he has successfully championed for Texas veterans, as well as policies that he will continue to pursue to expand healthcare options, help veterans enter the workforce, and start their own business. Learn more about the Department of Texas Veterans of Foreign Wars.